I've been running for six years now, and I've done races from a 5K to a marathon several times over. I am an RRCA-certified running coach. I have read countless books on different training methods. I've studied websites, and have tested out training methods on myself. I feel pretty comfortable saying that I'm "experienced", and I feel very confident when I talk about running. However, there is one key part of training (in nearly every method out there) that I was ALWAYS doing wrong. It wasn't because I didn't know how I was supposed to do it, it was just that it felt counterintuitive, and I felt silly when I did it correctly. I'm talking about "easy runs". Easy runs make up the majority of most major training plans available. They're called easy runs because they are meant to be run at an easy pace--a pace that requires little effort, sometimes called a "conversational pace" because you should be able to hold a conversation while you run. It's very simple! You don't worry about trying to hit certain times or paces during these runs--you just run "easy". However, the majority of recreational (even competitive recreational) runners do their easy runs too fast. Some may feel ridiculous going at a slow pace, some may be impatient and want to get it over with quickly, some may like to compete (even with themselves) to improve at each training run. For a lot of us, running hard feels like we've really accomplished something--the sweat, sore muscles, heavy breathing--it feels good. Easy running doesn't FEEL like you're doing anything worthwhile (but I hope to help you realize that the easy runs actually are doing something very productive). There are numerous reasons that runners may run their easy runs too fast, but the point is, we need to do the easy runs how they are meant to be run: easy. I always ignored this bit of training info for myself. When writing training plans for other people, I was sure to include the slower pace suggestions for easy runs; but when doing my own training, I convinced myself that what I was doing was "easy", when, in fact, it was more "moderate" in effort. I just felt embarrassed by the slow pace required to keep my effort easy. Running slowly is very difficult in a mental aspect--we tend to feel silly about it. However, easy runs are the bread and butter of a training plan! After spending most of 2015 with a stress fracture, I finally decided to change the way I was training. The first thing I did was to run my easy runs at a truly easy pace, using a heart rate monitor to ensure that I didn't convince myself that a moderate run was easy. Using a heart rate monitor is the best way to ensure you're running easy enough, especially in the beginning. You may be surprised at just how much slower you need to run in order to keep your heart rate in the "easy" zone. When I was doing what I called easy runs before changing up my training, my "easy" pace was about 9:30. Once I started using a heart rate monitor, I realized that was definitely a moderate effort run, and to keep my heart rate where it needed to be, my pace had to be about 11:30! I made the decision to keep my easy runs at a low heart rate (I used Dr. Phil Maffetone's 180 formula), no matter how slow I was. And you know what? I really started to ENJOY my runs! Before, I was always dreading having to go for a run. It was a chore to me, and I never looked forward to it--particularly my long runs. Once I started the low heart rate training, I actually really enjoyed the running itself. I dare say that I even started to look forward to my runs, which I never did before. I still did some speed work, however. I now follow the 80/20 ratio of easy running to hard/moderate running... basically, 80% or more of the time spent running each week should be at an easy effort; and 20% or less should be spent at a moderate to high effort. Personally, I've been running five days a week, with two of those days being spent doing a modest amount of speed work. The other days? I kept my heart rate under 146 bpm, no matter how slow my pace had to be to keep it there. I got so much faster as a runner, and pretty quickly, too! My 10K pace had slowed to about 11:00/mile in 2015, due to some extra weight and poor training. I set a goal to run a 10K at a 7:55 pace in the spring of 2016, and that became the focus of my training. That's over a three-minute-per-mile improvement, which is a very LOFTY goal--but I did it (well, nearly--I'll find out for sure on Sunday! Regardless, I've done five miles at a 7:50 pace, so I feel confident). It only took me about four months of solid, good-quality training. I really feel that the easy runs have played an enormous part in my success. I also feel that the easy runs have helped me to drop to my lowest weight ever. Once I switched up my training, the weight came off pretty easily, and I had no idea why--the only thing I was doing differently was running very slowly on my easy runs. Throughout training, your body is constantly making adaptations in order to get fitter. The ideal scenario is that you can run fast while using minimal effort--but it takes a lot of training and adapting to get there. For someone who is just starting out, just running a mile takes an enormous effort and your body has to work very hard. As you continue to train, your body adapts by doing all the scientific stuff in order to make it easier. Your body doesn't WANT that run to feel hard, so it changes what it can to make it easier for you the next time. There are different ways that your body does this, and it requires different training efforts on your part during your training in order to make all of the necessary adaptations. When you run at an easy effort, your body is making very specific changes that are NECESSARY to getting your body in ideal shape; when you run at a hard pace, it is making different changes, which are also necessary. There are very good, necessary reasons to run at several different effort levels in order to get your body to adapt. That means you need to run at an easy effort sometimes, a moderate effort sometimes, and a hard effort sometimes in order to get all of those anatomical changes to happen. It's like baking cookies--there are necessary ingredients that must go into them in order for the cookies to turn out well. If you skip one or two ingredients, you may still get something that resembles a cookie--but it's not going to be the perfect, ideal cookie. It may taste bad, it may have a poor texture, or it just may not resemble a cookie at all. Doing all of your running at a moderate or hard effort is like leaving out half the ingredients in your recipe! You will still get some changes and adaptations, but it will be far from ideal. When you have all of the necessary ingredients (or training runs), you will have an amazing batch of cookies (or turn into a master running machine!). Some of the adaptations in your body can't occur when doing ALL of your running at a hard effort, so you won't get any better. In fact, MOST of the adapting comes from easy running, which is why it's important to do the majority of your runs at an easy effort. 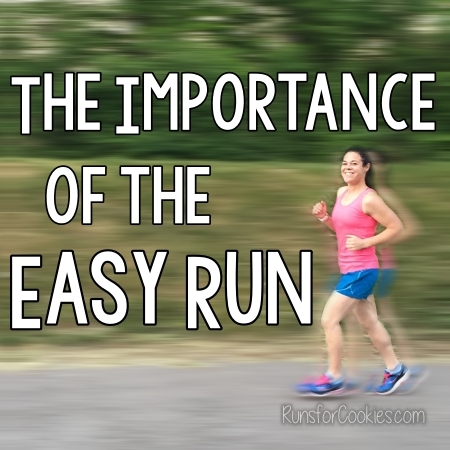 The easy running is like the whole base of a good cookie (flour, sugar, butter, etc)--and the moderate or hard running is the extra mix-ins, like chocolate chips or walnuts, to make it even yummier. In running, training begins (or should begin) with "building a base". Basically, that is a LOT of running at an easy effort--very little or no speed work. For a beginner, this could take six months to a year; for a seasoned runner, a few weeks will do. It just depends on the person. But during the base building period, the runs should be done at an easy effort in order to maximize your aerobic conditioning. Once you build that base, you can start sprinkling in some speed work. The speed work will go much more smoothly when you have a good aerobic base to start with. I realize this post is very long, and it really is just a long-winded piece of advice: "Make your easy runs EASY! ", but I hope that I've convinced you to actually do it. I read all about it over the years, and thought, "Yeah, yeah, I know--easy runs should be easy." I convinced myself that what I was doing WAS actually easy, but after utilizing the heart rate monitor, I realized that I was just kidding myself. One thing worth mentioning is that running truly easy on your easy runs makes your performance during hard runs much better. One of the first things I noticed when I switched up my training was that I had more energy to devote to my hard runs, and I was able to put in a really great effort; before, I was doing my easy runs too fast and my hard runs too slow. I enjoy my training much, much more than I did before. I have more energy during ALL of my runs--easy and speed work. I'm able to give a much better effort during my hard runs. My hard pace has improved dramatically--I PR'ed my 5K after just a month and a half of making the switch to easy running. 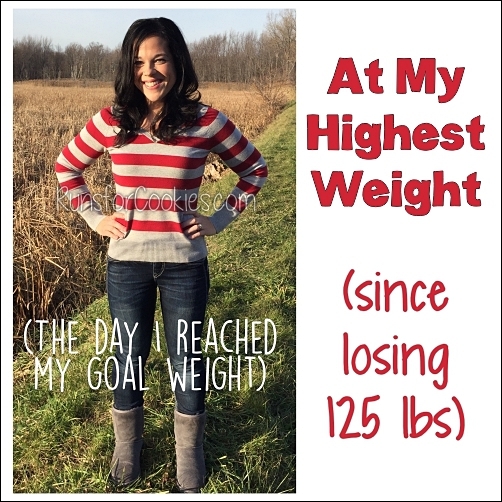 My weight and body fat continued to decrease, even when I wasn't trying to lose more. I have stayed injury-free, even with the very hard effort I give during speed work. Because I am doing much less speed work, I actually look forward to doing it. It feels good to run hard once in a while. I've learned that my body doesn't HAVE to run fast all the time in order to maintain my fitness. Even just running hard once a week will keep me in good shape. The easy runs are doing their job, even if it doesn't feel like it. Love your analogy to Cookie baking ! Great blog! I just bought 80/20 &started reading it last night! Wow, I thought I was doing this, but using the 180 formula I am still running too fast. Unfortunately, for my age my heart rate is so low that in my current condition I'm not sure I can run at all! My heart rate should be 128, not the 135 I have been using. Running at a snail pace my heart rate still gets into the 160's during the longer segments (using a walk/run method). I'm going to really focus on this during this mornings run and see what happens. Thanks for the great post! All praise the easy run!!! I think so many people are scared to run "slow" I race in the 8's and trying to break the barrier into the 7's but my easy pace is anywhere from 10 - 11:30 and I am fine with that. My HR is usually 130 or less on those runs (I should note I have a low HR and even on all out race efforts it doesn't really get higher than 160) and I think it has definitely been the determining factor in setting new PR's. Good luck on Sunday! I am going to try easy running. Have you ever run an easy run and for some reason your heart rate is unusually high that day and so you end up running slower than you normally would? I've only been doing the 80/20 running for maybe 6 weeks and my long runs I try to keep below 151. Last week for an 11 mile run average pace was around 11:30 and this week I was over 12:00+ pace for an 8 miler. I felt great and like I had plenty of energy and the darn watch kept beeping at me to slow down. It was frustrating because I was expecting to see a faster pace and I felt like I was barely moving. 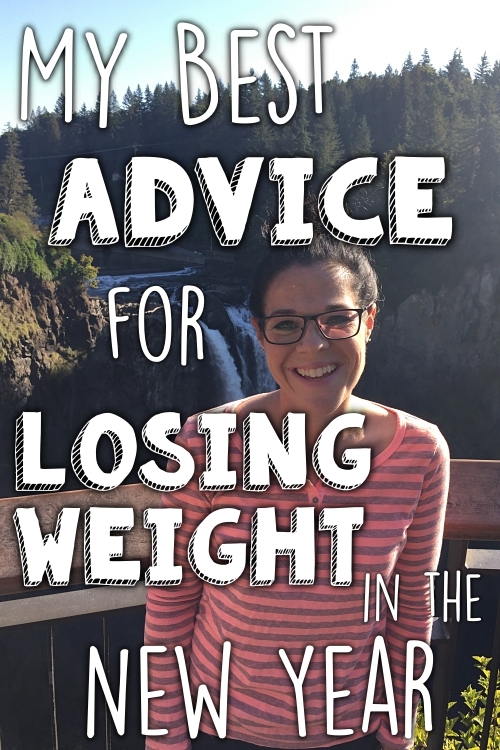 I love this advice! 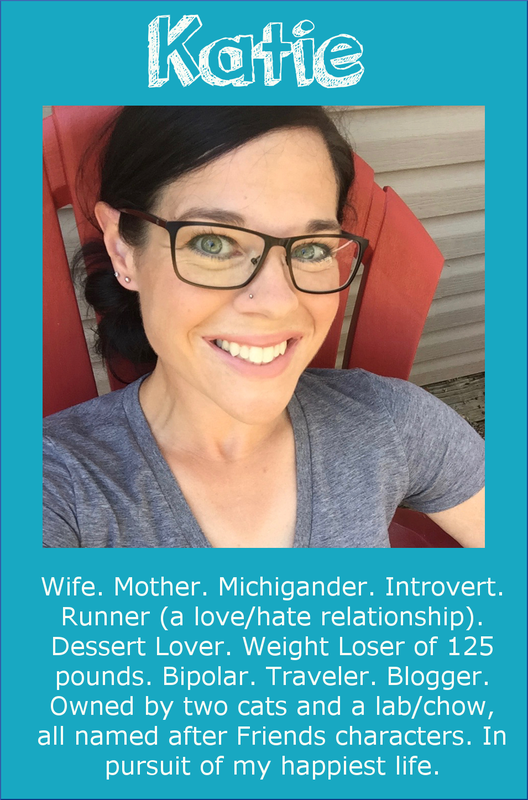 I've only been running for about a year, but my Fleet Feet training group has emphasized easy runs from the beginning and I have taken it to heart, mostly because I’m 47 and I can’t bounce back from injuries as easily as I did when I was younger! I like to run with others, but too many people I know are kind of obsessed with running faster and faster, even if they are only competing with themselves. I have learned to let others do as they wish, but if I know no one is going to be running at my pace for a particular run, it's better to run on my own. My only goal is to keep running as long as possible, into my 80s I hope, so that helps keep things in perspective for me. If I'm hurt or not having fun I'm not going to want to keep doing it. I'm so glad you have fully recovered from your stress fracture and are enjoying your runs more! What a great piece of advice! I like the analogy to cookies. I learned this lesson too late, and never well enough. I trained WAY too hard for my last marathon and it was a miserable experience. I know now that I did my long runs way too fast and I totally overtrained. As a result, my time was exactly the same as it had been at all my other marathons, despite training much harder. It was so disappointing. If I ever get back to running, I will get a heart rate monitor -- you've convinced me. But for now, I have to work out indoors with my kids -- I mostly do workout videos with the occasional elliptical workout mixed in. Do you have any thoughts about how to apply your advice to indoor workouts? The 80/20 rule seems crazy for indoor workouts where I'm not trying to PR, just maintain fitness. This is excellent advice! 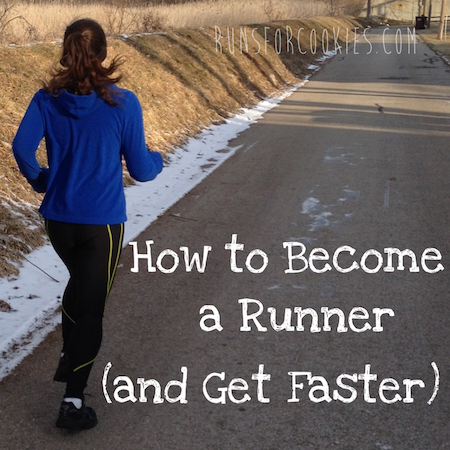 I've been running for about a year now and as you said, I've never 'wanted' to run my easy runs easy! I am also struggling with getting my heart rate up within the 80% zone. Even running up hill or doing speedwork, I stay within the 70% zone. I'm wondering about re-adjusting my HRM zones but not exactly sure how to do this. Any thoughts? Thank you so much, Katie! This is excellent advice! Using the HR monitor for easy runs and pace for speed work really helps to know which measurement I should be using for which runs! So helpful, as always! Excellent post! I have a couple questions.. I have been running for years and took the winter off b/c of L-A-Z-Y disease and am just getting back to it. I am normally a pretty "zen" runner and don't check my watch while running. I have a new GPS/heart rate monitor. How often do you check your heart rate? I feel like I am glued to the stupid thing! Do you ever "feel" your heart rate so you can just run w/o constantly checking? I'm not sure about your heart rate monitor, but my Garmin allows me to set an alert for if my heart rate exceeds a certain number. That way, I don't have to look at my watch at all--I just run and if I hear the beep signaling that my heart rate is high, I slow down. Once you get used to how you feel at the correct heart rate, you can pretty much guess what it is based on your breathing and how you feel. But you'll probably have to look at it for a while to get used to it. Ooooo....that would be fabulous! I will have to check to see if that "option" is available on mine! Thank you! Also...if you are running 5 days a week and incorporating 2 speed workouts isn't that more than 80/20? The 80/20 refers to the TIME spent running at easy/hard pace, not the number of days, runs, or miles... so it varies per person. 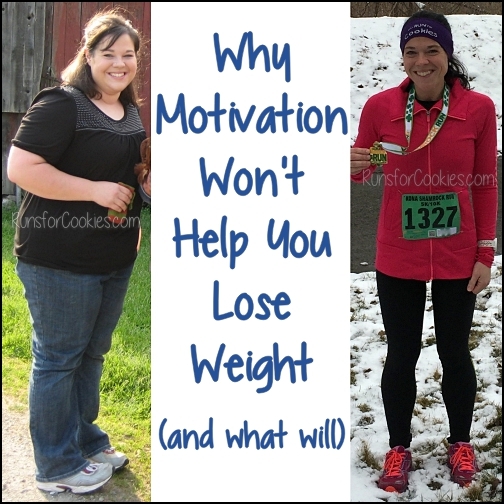 I've been running for a few years but not consistently and your blog is getting me inspired! I ran an easy run for the first time today and it was great. Planning to try some speed work tomorrow. 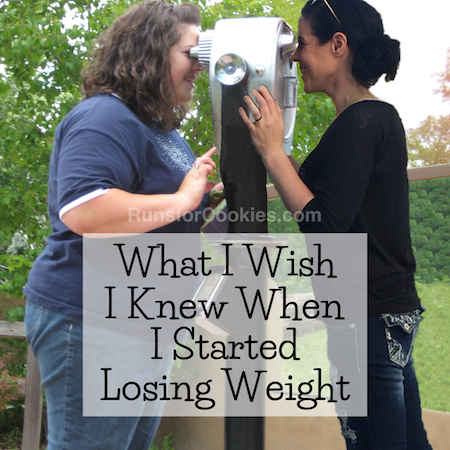 I also use myfitnesspal but not consistently and have been trying to lose 10-15 pounds. I'd go over one day and not want to enter everything in but if I don't track, I always go over. Thanks for the great tips and inspiration. Starting to track my calories again and also bought the training books you recommended. I'm excited about seeing some changes!